Singapore Watch» Blog Archive » Are Housing Prices still too high? 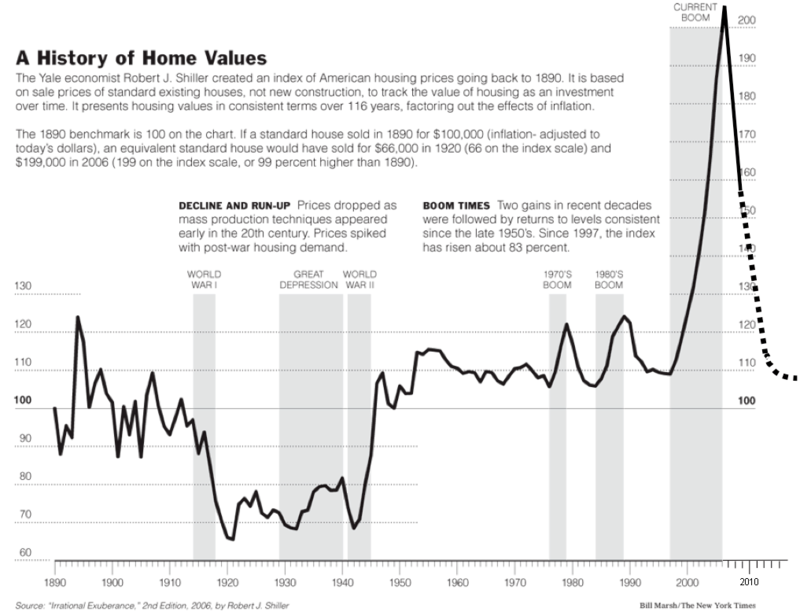 Are Housing Prices still too high? This is a graph of the price of single family homes since 1890 in the US. Even though housing has dropped 25% in price so far, it’s still way over-inflated in respect to prices in the 1980s. Does that mean that prices will fall a lot more before an equilibrium is reached? What’s also interesting to note is that WWII brought US out of the Great Depression (US converted car factories to build weapons for sale and use in the war). The war on Iraq and Afghanistan however, put US into greater debt, so fortunately we won’t be depending on a WWWIII to get us out of this recession. Unfortunately, things will not go back to normal till the housing situation improves. Singapore too faced a boom in property prices in 1997. Will prices correct to more reasonable levels? This entry was posted on Tuesday, February 24th, 2009 at 2:33 pm and is filed under Singapore Watch ver 2.0. You can follow any responses to this entry through the RSS 2.0 feed. You can leave a response, or trackback from your own site.